In Russia buckwheat is very casual. It is cooked a lot at home kitchens and in foodservice and served either to garnish meat courses or on its own. In most cases it tastes OK, but once I came across a cooking method that makes it completely irresistible. Since then we always cook it this way. What distinguishes the method is that before the usual steaming you slightly toast the buckwheat grains in a dry pan and then fry them in vegetable oil. This opens up their delicious nutty aroma. 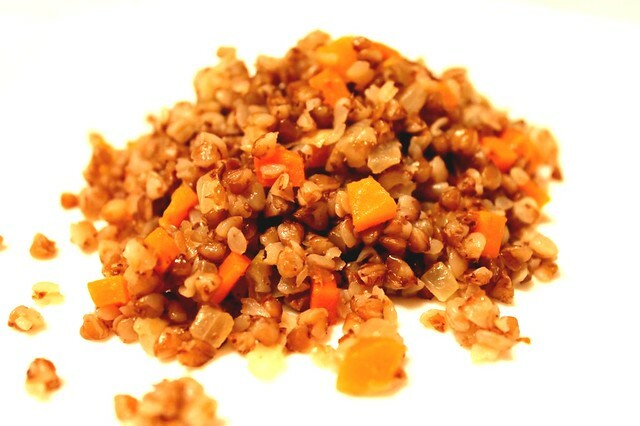 I really like adding sauteed onions and carrots to the ready buckwheat. Both are sweet and very much in harmony with its flavor. They also make it more balanced in case you serve it as a vegetarian meal. Set a heavy based pan over medium-low heat. Add the buckwheat and cook it without oil, stirring constantly for 3-5 minutes. It easily gets burned, so is important to keep the heat medium-low and to keep stirring. You will hear the grains cracking and will smell the delicious nutty aroma. Add the vegetable oil and cook stirring till the grains get coated and most of the oil gets absorbed. Add the water, cover with a lid and bring to boil. Cook under lid over low heat for 20 minutes. Turn the heat off and let it stand covered for 20 more minutes. It is key that you do not open the lid and do not stir the buckwheat till the end of these 20 + 20 minutes. Take the lid off and give it a stir (it is preferable to use a fork here to keep the buckwheat airy and friable). Add salt to taste. You could stop here and serve it plain as a garnish. For the topping peel and dice the onion and carrot. Set a heavy based pan over medium heat. Add the oil and let it heat up. Add the vegetables and cook stirring occasionally for 15-20 minutes till they get soft. They shouldn't brown. Add the sauteed vegetables to the ready buckwheat, give it another stir and enjoy. Lovely to read this, I have only just begun cooking buckwheat. One of my favourites is to add it when I am making bread. Yum! That's interesting. So you use buckwheat as part of you flour? In which proportion to other kinds of flour do you add it? Maria, very happy to find these instructions. However, are you using raw or roasted buckwheat? Thanks. Great to hear! I start from raw buckwheat, then toast it in a dry pan.